Gale Crooks, who lives just outside of Columbiaville, Mich., is a founding member and current co-chair of the Lapeer County Equal Rights Alliance, which hosts LGBT educational events and works toward equal rights in the county and beyond. 1) How did you get involved with the Lapeer County Equal Rights Alliance? 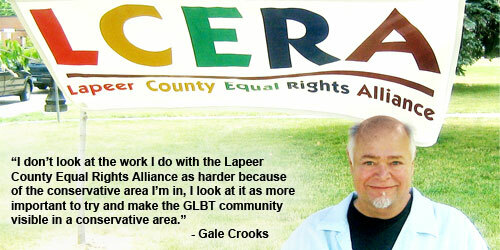 A group of Lapeer County residents started LCERA in 2003 with the politically motivated attack on gay marriage. I was one of them. We started LCERA to promote diversity in Lapeer County through education and community outreach and support. We became a 501(c)4 in 2004 – able to exist as a nonprofit, but also promote the advancement of equality and diversity in the county politically. Early on, we realized that no group stands alone, and by standing together to support civil rights and equality in general, we can support and encourage diversity in a homogeneous community. 2) Why are you passionate about working for LGBT rights in your area? 3) What are LCERA’s current top priorities? 1. Being a leader in establishing a Community Response System to hate and bias. We are in the early stages of this, and thanks to the help from the Michigan Department of Civil Rights, we have support in establishing this system. 2. Focusing our attention on the persistent issue of bullying in our community as we are able. 3. Being visible and present in the community. We do this by continuing our annual educational activities, providing support to local charities as we are able and keeping LCERA’s name out and about in Lapeer County. 4) Do you find it harder to advance your causes in a more conservative area of Michigan? I don’t look at the work I do as harder because of the conservative area I’m in, I look at it as more important to try and make the GLBT community visible in a conservative area. By being respectful of our community’s strong conservative and religious background, we have been able to make some valuable connections within the community, which makes my work easier – the road is slow, however. We are committed to just “show up and challenge” by presenting community educational programs and provide public support venues when discriminatory issues arise or we see them as high priority. 5) How is LCERA working to gain membership and clout in the local community? We are committed to being visible and present in he county. Several of us are on significant community organization boards. We try and respond to issues in our local paper’s editorial page, and we publicize widely when we have a specific service program. Just being visible with a platform and purpose is important.